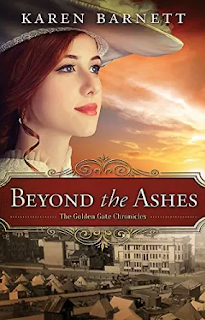 I read the first book in The Golden Gate Chronicles a few months ago, and really enjoyed it. So I was looking forward to reading Karen Barnett's Beyond the Ashes as well. The first book in the series, Out of the Ruins, involves a young woman in San Francisco to help get some risky, experimental treatment for her dying sister. In the midst of everything, the big earthquake occurs. I really enjoyed Abby, the main character in that story, so I was looking forward to book #2. This book was even more fun. Abby and Robert continue to be a major part of the story. But Robert's widowed sister, Ruby showing up to help her poor bachelor brother is a great addition. She's a bit shocked to discover that her brother is engaged, as he hasn't told the family at all. She's also a bit overwhelmed at just how much damage there still is from the earthquake. I think what I enjoyed the most about this story was the descriptions of the camps and the ongoing relief efforts. Everything was told in a way that made it seem fairly accurate, though I have to confess, I know next to nothing about what things were like in San Francisco in 1906. It just "felt" realistic. And since I'm in the midst of teaching teens to drive, a highlight for me was Ruby's driving lessons. How much things have changed! The religious aspect of the story is just there, not something that feels forced or pounded into you. I don't like reading books that preach to me, but I do enjoy stories where flawed people are struggling with real problems, doubts and fears.